By the time her Memoirs were written in 1838, Madame Tussaud was well advanced in modelling her own legend - Revolutionary history repackaged into tempting tableaux for a Victorian audience, with our heroine centre-stage. Who is to know whether she even met Maximilien? Nonetheless her Robespierre is interesting and possibly quite close to the man himself - reserved, careful of his appearance, thoughtful and courteous, not at all the stereotypical caricature of the bloodthirsty Terroriste. Amongst others who were induced to visit those melancholy mementos of despotism and tyranny, Madame Tussaud was prevailed upon to accompany her uncle and a few friends for that purpose; and whilst descending the narrow stairs, her foot slipped, and she was on the point of falling, when she was saved by Robespierre, who, catching hold of her, just prevented her from coming to the ground; in the language of compliment observing, that it would have been a great pity that so young and pretty a patriot should have broken her neck in such a horrid place. How little did Madame Tussaud then think, that she should, in a few years after, have his severed head in her lap, in order to take a cast from it after his execution (p.372). 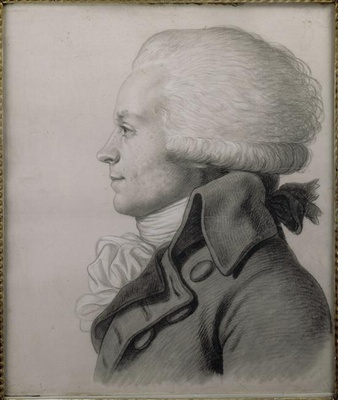 He was one of the most frequent guests at the table of M. Curtius, therefore Madame Tussaud had frequent opportunities of seeing him, and of conversing with him ; as, at the dinners given by her uncle to the eminent men of that day, it so happened that Robespierre was generally seated next her. He was always extremely polite and attentive, never omitting those little acts of courtesy which are expected from a gentleman when sitting at table next a lady, anticipating her wishes, and taking care that she should never have to ask for anything. In this particular be differed from Marat, who, selfishly eager to supply his own wants, never troubled himself with those of other persons. Robespierre's conversation was generally animated, sensible, and agreeable ; but his enunciation was not good ; he had not the talent, energy, nor power over his auditors, which were so eminently conspicuous in Marat. 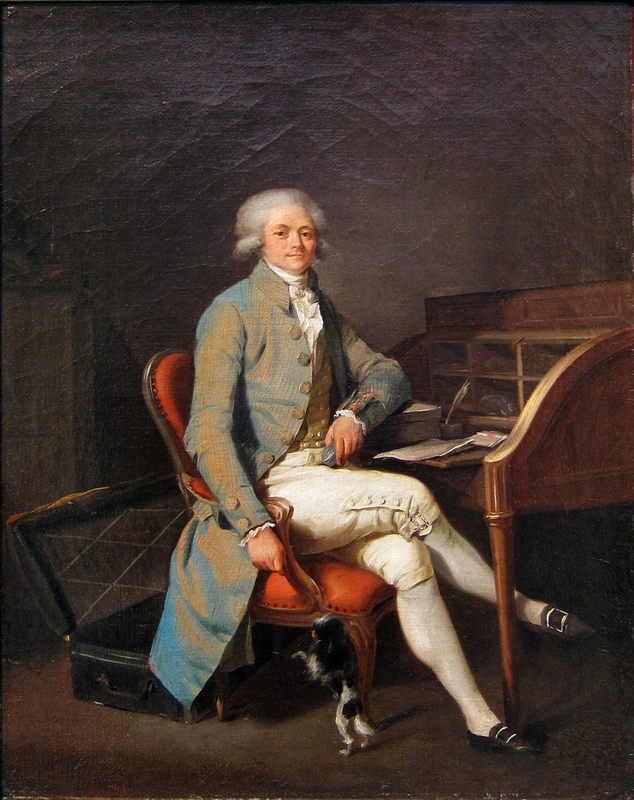 Portrait by Louis Léopold Boilly. Robespierre, Madame Tussaud states, was a middle-sized man, marked with the small-pox, and wore green spectacles, for the purpose of hiding, perhaps, his eyes, which were particularly ugly, the white being of a yellow cast; it has been also stated, that his sight was weak ; his features were small, inclining to sharpness ; they were not particularly expressive of ferocity, nor had they any thing sufficiently remarkable to have attracted notice, had he not rendered himself conspicuous by his enormities. In one respect he formed a perfect contrast to Marat, being fond of dress. He usually wore silk clothes and stockings, with buckles in his shoes; his hair powdered, with a short tail ; was remarkably clean in his person, very fond of looking in the glass, and arranging his neckcloth and frill. 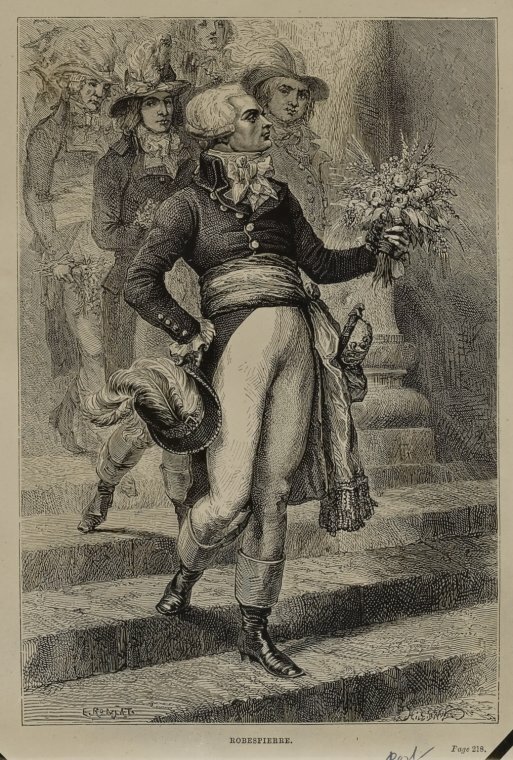 Robespierre exhibited much gallantry towards the ladies, and perhaps the reader may think sometimes carried his politeness too far. Walking one day on the Boulevards with a lady, she admired a house, which much struck her fancy. " Would you like to have it?" demanded Robespierre. " Indeed I should," replied the lady. " Then, madam, it shall be yours," said Robespierre ; and absolutely carried his courtesy so far as to have the owner denounced as an enemy to the republic, and immediately executed, and his property confiscated ; by which means Robespierre easily obtained possession of the house, and presented it to the lady. There is no politeness equal to that of the French, after all. Memoirs of Madame Tussaud by Francis Hervé.